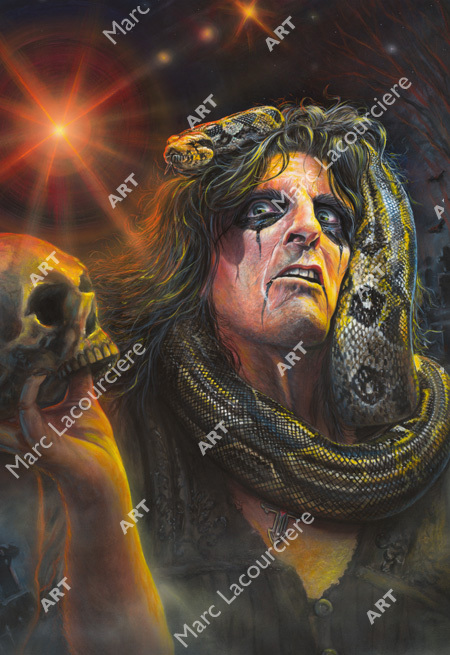 Media Size Choose an option18" x 24"22" x 30"30" x 40"
Welcome to a rockers nightmare, no one defines shock rock like Alice Cooper. 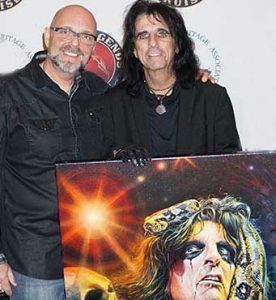 A Rock and Roll Hall of Famer and a great musician whose career spans five decades. Emerged from the Detroit scene of the 1970’s in a flurry of long hair, makeup and sequins to rock with a sense of showmanship. Alice simultaneously strikes fear into the very core of his audience that would cement his identity. He is the ultimate rock star of twisted and bizarre theatrical performances with iconic songs that we grew up and sing along with. I’ve seen the show many times which really inspired me to paint him in his element with his pet boa snake. 18" x 24", 22" x 30", 30" x 40"